↑ "Finally! "The 100 Greatest Japanese Rock Albums of All Time" Listed". Exclaim!. 2007-11-14. สืบค้นเมื่อ 2012-05-17. ↑ "X Japan's Incredible Ride: Meet Rock's Most Flamboyant Survivors". Rolling Stone. 2010-10-10. สืบค้นเมื่อ 2015-04-18. 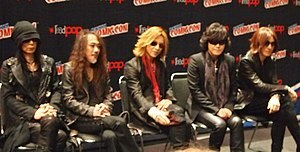 ↑ "X Japan: They're huge (really), and they're (finally) coming to the U.S." Chicago Sun-Times. 2010-08-01. สืบค้นเมื่อ 2013-05-05. ↑ "X Japan's Yoshiki on Touring the U.S., the Loss of Hide, and the Future of the Band". SF Weekly. 2010-10-05. สืบค้นเมื่อ 2013-12-14. ↑ 5.0 5.1 5.2 5.3 5.4 5.5 5.6 "The Jrock Legend: X JAPAN". jrockrevolution.com. สืบค้นเมื่อ 2010-09-03. ↑ "HEAVY METAL FORCE III". amazon.co.jp. สืบค้นเมื่อ 2012-10-29. ↑ 7.0 7.1 7.2 7.3 7.4 7.5 7.6 7.7 7.8 "Indies eXplosion: The Early History of X JAPAN". jrockrevolution.com. 2007-10-29. สืบค้นเมื่อ 2013-02-03. ↑ 8.0 8.1 "Extasy Records company profile". extasyrecords.co.jp/eng. สืบค้นเมื่อ 2007-08-06. ↑ "SKULL TRASH ZONE I". japan-discoveries.com. สืบค้นเมื่อ 2011-11-09. ↑ Jealousy liner notes, 1991. ↑ "RIAJ CERTIFIED MILLION SELLER ALBUMS". ocn.ne.jp. สืบค้นเมื่อ May 15, 2012. ↑ 16.0 16.1 Chad Childers (2015-07-15). "X Japan Planning New Album + Documentary for 2016". Loudwire. สืบค้นเมื่อ 2015-08-21. ↑ "X Japan stream historic single release". Metal Hammer. 2015-10-13. สืบค้นเมื่อ 2015-10-18. ↑ "X JAPAN Forced To Postpone Shows Due To Guitarist's Illness". Blabbermouth.net. 2016-02-03. สืบค้นเมื่อ 2016-02-03. หน้านี้แก้ไขล่าสุดเมื่อวันที่ 17 เมษายน 2562 เวลา 06:19 น.